Hungary joined the EU-China Light Bridge by illuminating and light painting the front of Hotel Gellért in Budapest close to the bridgehead of Szabadság Bridge. The facade of the iconic landmark hotel of Budapest, Hotel Gellért, was illuminated on the night of 3 March to mark the celebration of the EU-China tourism year. The two wings of the hotel building were lit in the colours of the flag of China and the European Union. The light-painting of the Art Nouveau style building was accompanied by animation, telling a story about the friendship of Hungary and China. The celebration was intended to be a part of the Light Bridge project. People attending the early-evening show at the foot of the Gellért Hill enjoyed a short Chinese cultural and music programe. On the next day, the guests of Hotel Gellért were invited to taste Chinese cuisine in Gellért brasserie or the restaurant of the hotel. The host of the evening was the Department for International Tourism Relations of the Ministry of Foreign Affairs and Trade. 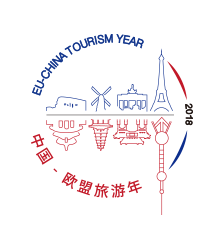 China National Tourist Office Budapest, key strategic partner of China – CEE Tourism Coordination Centre supported the realization of the event.